Moonstone is a variety of feldspar that displays an amazing optical phenomenon called, adularescence. Internallyrepeating feldspar layers scatter the light that enters the stone creating a mystical glow reminiscent of moonbeams.This glow comes to life, rolling across the gems surface, when it is moved. Adularescent labradorite with a multi-colored glow is sometimes called Rainbow Moonstone. refractive index, fracture, fluorescence and maybe birefringence. Moonstone describes a near colorless variety of labradorite feldspar when adularescence in the appearance of a blue sheen is observable. 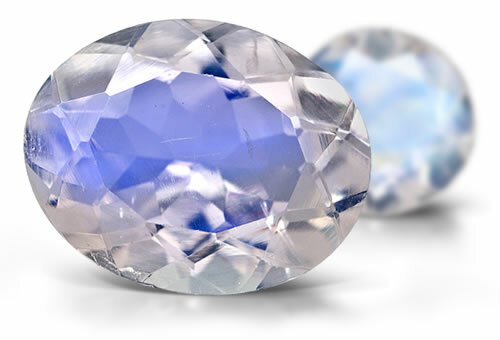 Moonstone occasionally contains colorless inclusions and might show parallel multiple twinning planes.